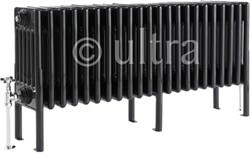 Ultra Colosseum > 6 Column Radiator With Legs (Black). 1011x480x220mm. 6 Column horizontal radiator in high gloss black with legs. 6158 BTUs. Size 1011W x 480H x 220D mm.